It's possible, even easy, to get a list of every Usenet newsgroup and publicly accessible mailing list. With very little effort you can convert the list into a program that will mail the same message to every single one of these groups. Doing this is called spamming, after the Monty Python sketch quoted above. An example of spam was the law firm that advertised their services in the so-called "Green Card Lottery" message. Other examples resemble chain letters. According to the Washington Post, at the time of the "Green Card Lottery" spam, the law firm in question considered the Internet to be "an ideal, low-cost and perfectly legitimate way to target people likely to be potential clients." Such reasoning is common amongst spammers. Many people disagree. They feel that, by not targetting their advertisments correctly, spammers are demonstrating how not to conduct commercial business on the Internet. Secondly, Usenet is not free. News articles are posted to thousands of machines throughout the world at a cost of thousands, of dollars. Since most spammers post their "advertisments", simultaneously, to hundreds of groups, they are spending quite a bit of somebody else's money. Finally, people who gather together to discuss a topic become annoyed when someone introduces something which is obviously outside of the group's charter. Many people pay to access the Internet - either by direct payments to ISPs or through phone connection charges. Every newsgroup posting that they download represents a proportion of that cost. So, unlike paper junk mail, you pay for spam. Under these circumstances, it's not suprising that people are angered by spammers. First, never reply to the group. The spammer won't read it. He is interested in talking, not listening, and he is not a regular reader. Your angry posting will not only annoy the other members of the group but will not affect the spammer in the slightest. If you have quoted the original spam in your reply, you will also circulated his advertisment even further. You might consider replying to the spammer at his own email address as quoted in the message. For a start, the email address is likely to be forged. If it is a non-existant address, your email will be returned to you indelivered - costing you more money to download it again. If it is a valid email address, it is possible that the address belongs to someone totally unconnected to the spam who is now being flooded by emails complaining about something that he knows nothing about. Finally, some spammers buy and sell lists of email addresses. Replying to their messages may just mean that your email address will be harvested and marked as both a valid address and active - in which case, prepare to receive lots more spam! There are groups of people who do fight spam. Some provide information on how to trace a given message back to it's originating source and how to complain to the right person. 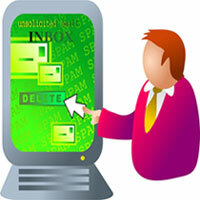 The right complaint to the right place can result in a spammer's Internet account being terminated. Most decent ISPs don't like their customers being involved in spamming and their AUP (Acceptable Use Policy) normally mentions this, specifically, as an abuse of service. I've included a couple of sites which provide technical information on spam tracing, and complaints, below.